After seeing this question once again on this site (Is there a modern wine that is designed to resemble ancient Roman winemaking?) sometime back and I became interested in knowing if there is a modern wine that is designed to resemble Noah's wine from the Turkish region of Mt. Ararat after the biblical deluge? I am not interested if one believes in the story of Noah's Ark or not. Nor am I interested in any possible historical timeline for the great regional flood which spared Noah and his family. Noah's wine is a colloquial allusion meaning alcoholic beverages. The advent of this type of beverage and the discovery of fermentation are traditionally attributed, by explication from biblical sources, to Noah. The phrase has been used in both fictional and nonfictional literature. "Noah's wine" refers to alcoholic beverages. In the Bible, the few chapters that come between the creation of Adam and the birth of Noah contain no mention of alcoholic drinks. After the account of the great flood, the biblical Noah is said to have cultivated a vineyard, made wine, and become intoxicated. Thus, the discovery of fermentation is traditionally attributed to Noah because this is the first time alcohol appears in the Bible. 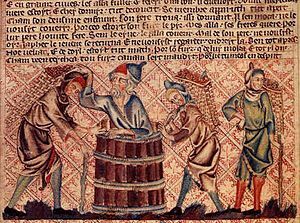 Noah's wine has been described as a "pleasant relief for man from the toilsome work of the crop". Is there a modern wine, commercially available today, that is intended to resemble the ancient Noah's wine as closely as possible from any of his many possible timelines (more or less)? These guys aren't claiming that it's Noah's wine, but they are saying they are using the same methods that they used 8000 years ago to make wine and you can buy it in the Republic of Georgia. Is Georgia's Ancient Wine Making Method Making a Comeback? You can buy it around the world supposedly. Other than trying something out for historical purposes, the wine probably didn't taste all that great. They probably drank it young since they didn't have bottles and it was likely very cloudy and low alcohol. Probably not red since that would require fermenting on the skins in a controlled manner. Probably like a cloudy rose' or a orangeish white. We'll never know what grapes were used by Noah. Karasì is not designed to resemble that of Noah's wine, but it may have some small characteristics of the grapes Noah used. Karasì, is a tribute to the 6100 year wine tradition of Armenia. Aged in traditional amphorae, hence its name, ‘from amphorae’ in Armenia, this wine embraces the living heritage of a country while at the same time it delves back into a long forgotten chapter in the ancient history of wine. The King of Armenia’s grapes and possibly one of the oldest grape varieties in the world Areni has been present in Armenia for millennia. Never grafted and on its own roots, it is 100% indigenous to this land with a unique DNA proﬁle that does not match any other. Elegant and fresh, thick skinned and extremely resistant to disease, through the ages Areni has adapted perfectly to the high altitudes and extreme temperatures variations of Vayots Dzor, its natural habitat. One of the world’s oldest civilizations, steeped in a history and tradition that dates back millennia, Armenia’s territory lies in the southern Trans Caucasus in the highlands surrounding Biblical Mount Ararat. The Cradle of Vine and Wine, the vine has forever been present in the valleys of Armenia with the wild Vitis vinifera silvestris, ancestor of the cultivated vinifera vine species, already established in its highlands over a million years ago.